I Love All Of These New Sauces! 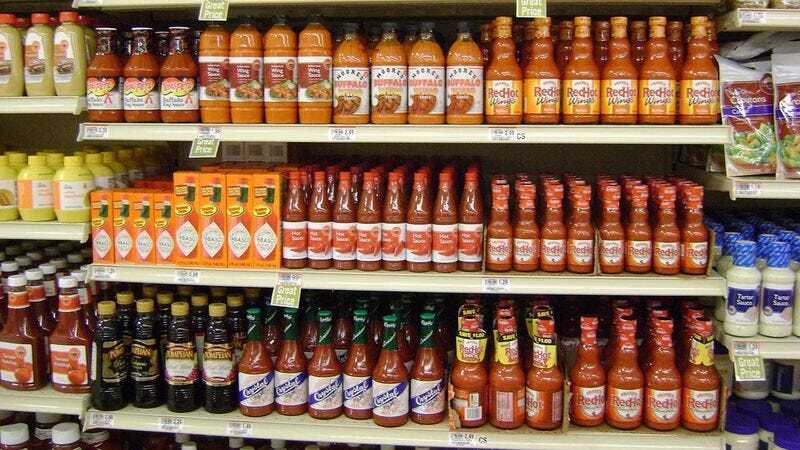 When I went to my grocery store last week, I found myself wandering down the sauce aisle for a little longer than usual. I picked up the regular bottles of ketchup, mustard, ranch, and hot sauce, but then something incredible happened: I noticed a variety of new sauces I had never had before, and my interest was piqued. I tried a few of these sauces and loved them. I love all the new sauces. For me, it was a revelation. I thought I knew about all the sauces, but then bam! I’m at this new store face-to-face with all of this sauce that I never knew existed. I’m talking chipotle mayo, I’m talking jalapeño-infused ketchup, I’m talking peanut sauce, and I’m talking lemon gravy. Love, love, love, and love! Chimichurri. Ghost pepper sauce. The purple one. These are all great sauces. I love them. Olive oil is kind of like a sauce and I like that. With so many sauces, I was spoiled for choice. Sweet, sour, sweet and sour. A guy just can’t go wrong. I’m talking chipotle mayo, I’m talking jalapeno-infused ketchup, I’m talking peanut sauce, and I’m talking lemon gravy. Sure, the old sauces are great. It would be disingenuous of me to say I didn’t love classics like blue cheese, tzatziki, barbecue, sweet chili, and Worcestershire. but I love these new sauces too. You can dip or you can pour. There’s no wrong way to get sauce onto your food, even if you put a bunch of sauce in a leaf blower and turn it on while it’s over your plate. Sometimes sauces come from dispensers that you can’t take from the restaurant. But other times they come in little packets and you can take as many as you want! Packets! Of sauces! I love sauces no matter what container they come in. You could fill a house to the brim with sauces and I would buy that house, no questions asked. Is salsa a sauce? Because I like salsa too. So, welcome to the family, chipotle mayo, jalapeño-infused ketchup, peanut sauce, lemon gravy, and all the other new sauces out there. I’m excited to have you. I’ll wager there are new sauces I haven’t heard about yet. I’m sure I’ll love them. I can’t wait to find them and love them!